Read Our Tips For Keep Your Household Organized and Looking Great! If you’re familiar with our designs you’ll have noticed that our clean contemporary aesthetic suits those who keep their living environment uncluttered and organized. Browse our galleries and you’ll see Pinterest perfect interiors, however, keeping a home this clean and organized can feel like a full-time job. With a career and a family to keep track of, it’s easy for the clutter to get out of control. After a while, the job seems so big that you don’t know where to start. It seems overwhelming. But, any organizational expert will tell you to take it one room at a time. Eventually, everything will be in the right place. There’s no need to get it all done in a day! The new year offers a great opportunity to get organized. Here are some of the best household organization tips that you should try out. The table by the door usually turns into a junk catch-all. You get your mail, you throw it on the table. Instead, make it a point to keep this area organized. Remind yourself as you walk through the door that the Bloomingdales catalog goes straight in the recycling. This area should have special spots for everything that belongs there. Keys on the key-holder, mail separated by bills and personal in an organizer. If it doesn’t have a home, it doesn’t belong there. Getting into this household organization habit will ensure you never lose your keys or important mail again. When you start organizing your home, you might be tempted to go out and buy household organization accessories. But, the last thing you need right now is more stuff! Before you do that, go through the house and purge what you don’t need. You might find you don’t really need a bigger shoe organizer. It wasn’t until you sorted through the mess that you realized you could throw out a few pairs. Trying to organize your bedroom closet can turn into an hours-long fashion show. You promise yourself that you’ll wear that leopard print jumpsuit someday! First, take any clothes that aren’t seasonally appropriate and put them in storage bins. Next, turn all the hangers so they’re facing towards you. Whenever you wear an item, put it back in the closet with the hanger facing away. After six months, take whatever you didn’t wear and donate it. When you’re trying to get everything in a drawer, you end up stuffing things on top of each other. Instead, have cabinets and drawers sectioned off so you can see everything. Buy plastic sectionals for drawers. Every piece in the drawer should get its own spot. Plastic baggies go in one section, chip clips in another. 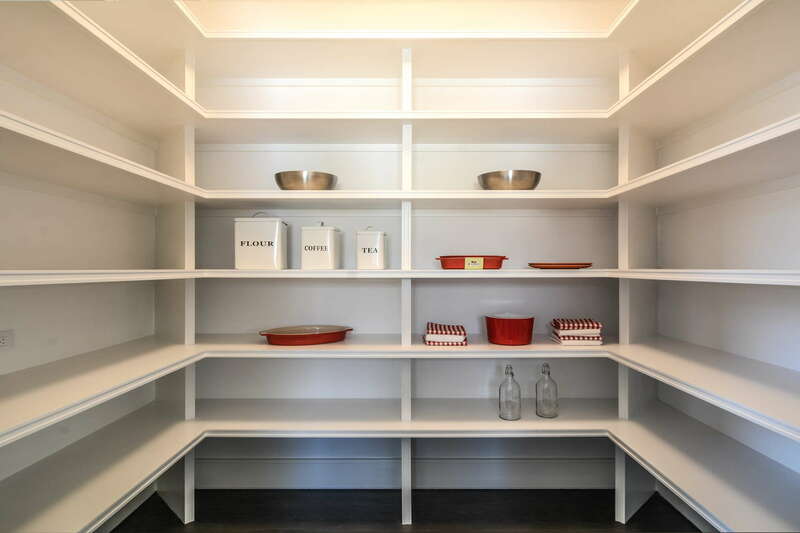 Stacking shelves can go in your cabinets. That way you don’t have to stack your soup bowls and your dessert bowls all on top of each other. You can maximize the vertical space. This rule goes for the kitchen, the closet, or any other part of the house. Keep the items you use most often at eye level. That way when you go to look for it, it pops right out at you. Store items that you use less often below eye level. Items you hardly use but still need go above eye level. That way you won’t constantly be reaching for the stepping stool. The bathroom is a space that’s often overlooked when it comes to organizing. You can use drawer and medicine cabinet organizers to keep everything in check. But, don’t forget that lots of bathroom products have expiration dates. Most makeup and skin creams expire in about a year. Medications have a short shelf life too. Make a bathroom purge a regular habit. We design our Modern Barn bathrooms to have a spa-like feel, in order to keep them looking this streamlined we build in plenty of drawer space. That might seem like its own kind of clutter. Actually, you’re training yourself and your family to toss out the trash before they leave a room. It should become as natural as turning off the lights. It can also serve as a reminder to toss knick-knacks right when you realize you don’t need them. Sure, the main trash can might only be a few rooms away, but having a wastebasket right there will encourage you to get rid of it now. Even if you’re totally organized, it’s hard to make your kids play along. Their toys can end up taking over the whole house. You might not be able to make them always put their toys away. But, you can be prepared for a quick living room clean up before last-minute visitors. Find a stylish chest or an ottoman with storage that is designated to only hold toys. When you only have a few minutes to tidy up you can throw the rogue toys in there. When a favorite toy goes missing, you know the first place to look! One way to keep household organization more fun is to make it look like a design choice. For the kitchen, you could put up a pretty pegboard to hang pots, pans, and utensils. That gives you a great reason to put each piece back where it belongs every time. You can put dry goods in glass or vacuum sealed containers. It keeps your food fresh, and you no longer have to look at messy bags and boxes. It’s easy to do a household organization overhaul during a long weekend. It’s a lot harder to maintain it. That’s why you need a plan of action. Pick out a 20-minute window that’s convenient for you. Find a time that’s usually consistently free so you can develop a routine. Now set your cell phone timer for 20 minutes and get to organizing. Race against the clock to try to put away as many things as you can. You can even enlist your kids and try to turn it into a fun game. It’s a win-win. You get help cleaning, while they learn good habits. Remember, if you do a little organization each day, your home will never turn into a full-blown disaster. But if it does (life happens! ), now you know how to fix it. Looking for more articles like this one? Check out our blog for more useful home and family tips.